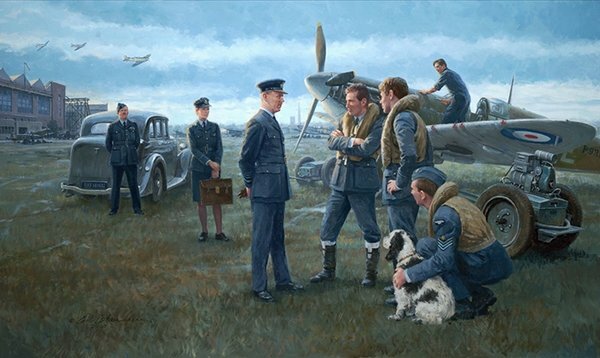 Air Chief Marshal Sir Hugh Dowding, Air Officer Commanding RAF Fighter Command emerges from his staff car during an impromptu visit to RAF Hornchurch in the early stages of the Battle of Britain and chats with Spitfire Pilots who have returned to their base. Their intense clashes with the Luftwaffe in the skies over Southern England still resonate in their minds. Dowding would refer to them as “my fighter boys”. It was Dowding, who more than anyone, prepared Britain’s defences against a German invasion years before the start of WW11.